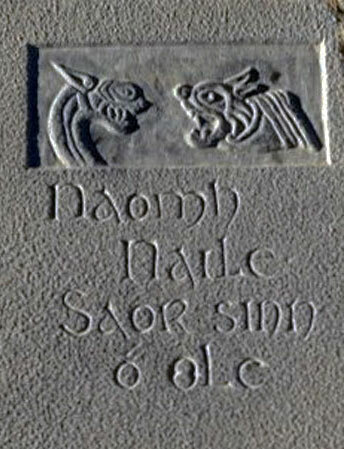 Cill Naile or Killenaule was founded by St Naile or Nathalis son of King Aengus High King at Cashel. This saint is said to have put a curse on the people of Ossory whereby a couple would be transformed into wolves for seven years. If they were still alive after that time they were allowed to return to their human form and another couple would take their place. These wolf-people were known as Faoladh and were known to be protectors of children and they also helped people who had lost their way. It is said that during the seven years of wolf form if the human body was moved the soul of the wolf would not be able to find it and therefore could not return to human form. There was an innate fear of wolves in the people of Ireland at that time and the ancient name for wolf was “olc” – which also translates as “evil”. “Saor sinn o olc”. The town of Killenaule lies at the Southern extremity of the range of The Slieveardagh Hills — situated 17 miles from Clonmel, 10 miles from Thurles, 10 miles from Cashel and 28 miles from Kilkenny City. The area has a chequered and colourful history, from Scandinavian invasions in the 9th Century, to a battle at Crohane in 852. In the Norman Era, Killenaule was granted to a settler named Stantton, and the town achieved the status of Borough. Names associated during this period with Killenaule include Butler, Laffan and Cantwell. Appraisal: Located in a prominent position over the street below, this church is typical of Gothic Revival style buildings. Designed by J.J. McCarthy, it boasts a very fine interior with fine stained glass windows over the ornate sculpted reredos and the colonnade of clustered columns is distinctive. These features not only add architectural significance to the building but also exhibit the skilled craftsmanship used in its construction.The modern parish is situated in the baronies of Slieveardagh and Middlethird.The founding of Killenaule can be traced back to the 5th century when St. Naul established a monastery here, around which a village soon sprang up.It is geographically located on the main Kilkenny/Cashel road, approximately twenty-three miles from Kilkenny and eleven from Cashel, sixteen miles north of Clonmel and ninety-five miles south-west of Dublin. The population statistics are circa 2300 while the parish consists of 25,025 statute acres Killenaule town is built on the River Bauteogue which flows from Ballynonty direction through Killenaule, down by Graigue, St. Johnstown, Knockelly etc and eventually it joins the Clashawley.This river flows through Laffansbridge and forms a boundary between the townslands of – Graystown, Burnchurch, Cattaganstown, Buffana, Knockinglass and Clonbrogan, where it eventually joins the Suir. During the 16th Century and the reign of Henry VIII lands in Killenaule were under the ownership of names like Britt, Purcell and again Cantwell and Butler. Around the mid 1500s landowners included Thomas Morris in Killenaule, Ballinure, Ballintogher and Moyglass. In 1640 the chief landowners among others were, Theo Mansell, Cataganstown 560 acres, Edmund Kearney Knockinglass, 800 acres, Everard of Fethard, 600 acres in Moyglass lower, Robert St. John, 300 acres in Roan, Cantwell of Killeens 700 acres, James Earl of Ormond 1600 acres in Killenaule. In Ballinure, landowners were Richard Tobin and Walter Hackett, Florence Fennell had 160 acres in Cooleagh, Morish Stokes, 800 acres in Coolquil and Henry Laffen had 1600 acres at Noan. The principal Landlord in the Killenaule area was an absentee landlord named Waldron and the town of Killenaule was part of the Waldron Estate in the early 1900s. On the death of Mr Waldron the deeds passed on to the trustees of the Bank of Ireland. Around 1976 much controversy arose in Killenaule as some of the Waldron leases had expired and the townspeople wished to purchase outright the leases on their holdings. Various local meetings were held and with the co-operation of Tipp SR. Co. Council, and legal advice, a satisfactory agreement was reached between leaseholders and Waldron Reps. In more modern times the two largest estates adjacent to Killenaule have been the Lanespark Estate, Ballynonty, and the Noan Estate, Ballinure. These both provided a welcome boost to the local economy by providing employment and various small industries. Killenaule and its surrounding area, has a large and varied history and heritage to offer. The area has many fine ancient Ring Forts, Tower Houses and Castles to support its local history. Rathmoley double Ring Fort is one of the finest complete double Ring Forts in the Country now preserved by the State. It is also situated in a prime viewing area very adjacent to Killenaule Town and discovered on its site, in Autumn 1925, was The Killenaule Viking Silver Hoard, now in the possession of the National Museum of Ireland. The site of Killenaule Castle is just a few hundred yards from the town centre and the Norman Graystown Castle is just a few miles to the south west of Killenaule. Other notable Castles are St. Johnstown, Coolquill, Mortlestown and Cooleagh Castle at Ballinure. The area has many natural resources including coal mining and peat harvesting. Killenaule is also noted for the very successful horse racing industries and numerous greyhound breeding and training establishments in the locality. In recent years, Killenaule Stone Quarries have established a thriving business at Kilbrennal Quarry. The stone is both used as road trunking and also very much sought for ornamental design. 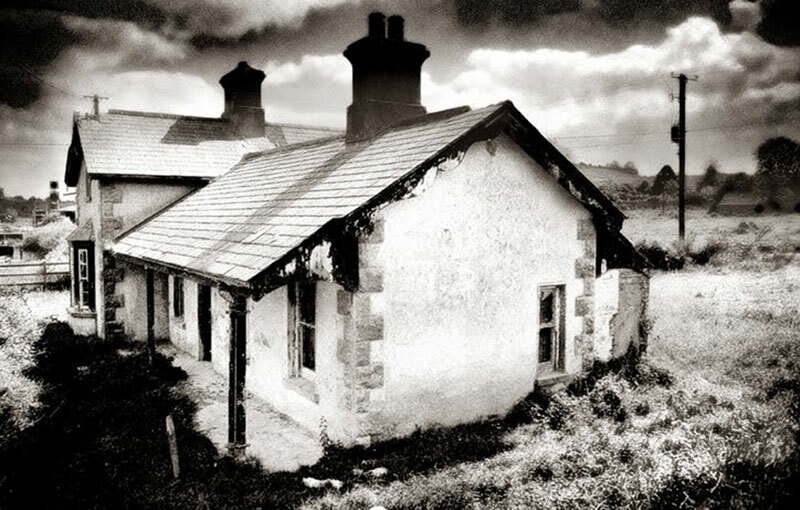 The surrounding bogland has left a Hugh store of folklore and as this area was the last Gaelic speaking area of Killenaule, a large vocabulary of many old Irish words have remained in the area. The late Dr. Thomas Morris, former Archbishop of Cashel & Emily documented these for posterity. The normal piseogs that exist throughout rural Ireland can be heard in the Killenaule area. The Hills of Killenaule Festival provides entertainment cultural, sporting and musical around mid-summer and has been growing in popularity since its inception three years ago. There are at least four local historians in the locality and much activity surrounds the now restored Church of Ireland in River Street, which houses the Slieveardagh Rural Development Co. Ltd, administrative centre, and is also the local Cultural and Enterprise Centre. All of the data from headstones from the ten local cemeteries have been logged and computed and also available to visitors are the complete list of death records for Killenaule, dating back to when these records were first logged. Killenaule is also the home of Derrynaflan Island, where on a dark February Sunday evening in 1980, Mr. Webb and his son unearthed the priceless Derrynaflan Hoard, consisting of an 8th century chalice, a strainer or ladle, a stand — all enclosed in a bronze basin, buried eighteen inches below ground, and found about 20 yards from the main church ruin. This priceless archaeological find continues to bring many students of history, historians and interested tourists to our area to view the exact location of the find. Derrynaflan Island is situated approximately 4 miles north west of Killenaule Town. Bord Na Mona at its former works at Littleton and more recently at Killeens briquette factory provides a national fuel resource and also valuable local employment. Local traditions of cheese making can be found at the home of Mr. Louis Grubb, Silverfort, home of the famous “Cashel Blue Cheese”. Also cheese is made at Sullivans Ballinure, home of Derrynaflan variety. A number of local people are involved in the craft industry, mainly in needlework, Art, and Hurley making. Scoil Ruain is the base of Derrynaflan School of furniture & design, where post Leaving Cert students study the craft of designing once off furniture pieces. 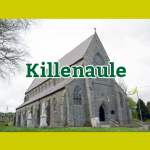 Killenaule Tidy Towns Committee and numerous other personal, have had and continue regular meetings with senior officials of Planning, Environment, Roads, and Sanitary services to keep abreast of proposals and council initiatives, concerning Killenaule Town and surrounds. The main concerns at these meetings entail traffic restrictions in Killenaule Town, proper sign posting derelict sights and dangerous and derelict buildings in our locality. Concern has also been aired regarding proper public lighting, provision of proper footpaths and car parking and public toilet facilities, also the planting and landscaping the approach roads to our Town. Killenaule Town has had a new Sewerage system installed at Crosscannon in recent years. This system is capable of, and has the capacity to deal with current housing development as of now, however, future development may entail an enlargement of this present system. There is a steady rate of planning for housing in close proximity to our town and surrounding area. The applicant base is generally young married couples whose employment base is one of Thurles, Clonmel, Cashel, Kilkenny or Waterford City. Killenaule is ideally situated and provides all of the services necessary and demanded by young families building residential homes in our area. Buildings listed locally in need of conservation include the Old Distillery Building at River Street, the former Killenaule National School now St. Mary’s Community Centre. A number of derelict buildings and sights are at present under scrutiny and in co-operation with the environmental officer of Tipp SR Co. Council; progress on this issue is expected shortly. Killenaule is a self-sustaining town to a large degree, containing seven public houses, a supermarket, five grocery shops, a hardware shop and a Glanbia provisions store. its service include a medical clinic, a modern nursing home, three hairdressers, two victuallers, one bookmaker office, one central primary school, one secondary school (600 pupils), one roman catholic church, one Garda barracks, two drapery shops, a solicitor’s legal business, three garages and filling stations, two guest houses, one chemist shop, a funeral parlour and undertaking business, public health nurse, two practising medical doctors, a modem post office service, three existing town taxi services, one dry-cleaning service shop, a modern chip shop. Public buildings include a modem Sports Complex Centre, a Heritage Cultural & Enterprise Centre, St. Mary’s Catholic Church; St. Mary’s Community Centre Bailey Street, a Credit Union Centre, two Electrical and T.V. shops. Killenaule town is serviced by Tipp S8.R. Co. Council Refuse Collection, a once weekly service. The existing bus services include twice daily Clonmel-Thurles and reverse. A bus service also exists to Kilkenny City daily. Train services are available at Clonmel (17 miles) and Thurles (10 miles). The National Bus service route can be availed of at Littleton (6 miles) and Urlingford (12 miles). For the last 10 years Killenaule has provided its own FÁS Community Employment Scheme giving valuable training and experience to prospective employees. It has also used the FÁS Youth Training Schemes to publish the “History of Killenaule / Moyglass” in 1990, this gave valuable employment and experience over two and half years to over twenty young people. The Youth Training Scheme was also employed to renovate the existing Culture & Heritage Centre at River Street. The existing Community FÁS Employment Scheme provides numerous local services e.g. Maintenance of Local cemeteries, grass cutting and cleaning of public Buildings in the area, erecting approach fencing and walls to town, planting and maintaining public flower beds etc. and assisting in running local festivals, concerts and public events. The Settlement and Architecture of Later Medieval Slieveardagh, County Tipperary. Location: Killenaule castle site was situated in the southern hills of Slieveardagh (Fig. 26). Killenaule castle was sited at and altitude of 150 metres in the upper reaches of a river valley within the Slieveardagh hills. The castle was sited on a scarped ridge which falls away steeply on three sides to marshy ground and a stream. The site has a southerly aspect with a good view in all directions and is in the shelter of the Killenaule hill to the west and is adjacent to the main road from Ballingany to Killenaule. History Killenaule settlement (37) was as a borough and a manor of the Earl of Ormond (Orm. Deeds VI; Martin 1979,44; Graham 1988,29). Killenaule castle is first mentioned in 1482 when Walter de Burgo of Cashel was held at the Earl of Onnond’s prison in Killenaule castle (Orm. Deeds III, 246-7). The Civil Survey makes no reference to a castle in its description of Killenaule (Civil Survey I, 104). Killenaule Castle is depicted on the Down Survey parish map. Estate maps of Killenaule town from 1816-1817 also depicted a castle (National Library 21F 47(7-8).). The Ordnance Survey also noted the area was called the rocks (0. S Letters Co. Tipperary II, 195) Killenaule was recorded as a borough and a manor of the Earl of Onnond (see Martin 1979, 44. Graham 1988, 29). Discussion Killenaule castle site may to have functioned as a motte in the early Norman phase of the settlement of Killenaule. This site took advantage of the steep slope of the limestone ridge on three sides and waterlogged surroundings for defence. The southern end of the ridge was sepmated from the rest of the by a rock cut ditch. The spoil from the ditch may have been used to heighten the end of the ridge. Further ditches along the ridge indicate small enclosures taking advantage of the height above the water logged surroundings. The flat, raised areas to the east of the ridge may have provided additional ground for settlement or building activity. Description Killenaule Castle site consists of a scarped ridge downhill to the east of the modern town of Killenaule (Fig. 57, Plate 41). The site slopes steeply on its east south and north sides and slopes to a stream on the west side. The lower ground to the south and east is prone to water logging (Fig. 56, Plate 40). The southern end of the ridge forming the site appears to have been heightened and separated from the rest of the ridge by a ditch. Two other shallow ditches further along the ridge the north appear to create small enclosures. The field has three other flat areas to the east of the ridge, separated by shallow channels covered in reeds and prone to flooding. One flat area has a standing stone, used as a scratching post for cattle. There are no physical remains of a stone building either on top of the site or in the field. Post medieval enclosure divided the field in two; the field boundary has been removed but can still be seen as a portion of a wall and a linear earthwork running north-south along the flank of the ridge (Fig. 56). Killenaule townland was subdivided by nineteenth century and the site of the castle gave its name to the townland; Castlequatter. were dug out. Presumably the tower house was the caput of the manor of Killenaule and the centre of the power of the Earl of Ormond in the parish; the seneschal (sheriff) court may have been held in the tower house. The castle appears to have been destroyed some time between 1817 and 1840. Location: Killenaule is situated in the southern hills of Slieveardagh. The church was sited at an altitude of 160 metres on ground sloping gently to the west to a stream and had an easterly aspect. Description: . Nothing remains of the medieval church at Killenaule. The church was replaced by a modern Protestant church built some time after 1827. The previous church on this site which may well have been the medieval church was only adopted by the Protestant community in 1771 when it was recorded as having a clay floor (Hassett & Fitzgerald 1990, 35). 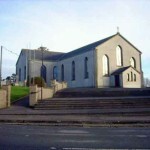 The church served the community and borough of Killenaule as the parish church. Killenaule Church appears to have been a pre-Norman church site. Killenaule means St. Naile’s Church; St. Naile was an Irish saint and the patron saint of Kilmanagh, county Kilkenny (Joyce 1887, 146). River Street in the modem town of Killenaule curves and follows the precinct of the pre-Norman church (Fig. 57). Comment: Killenaule church served as the parish church. The site had been in use from the Pre-Norman period until recent decades. However, because no physical remain of the church survive, nothing can be said about its architecture or date. 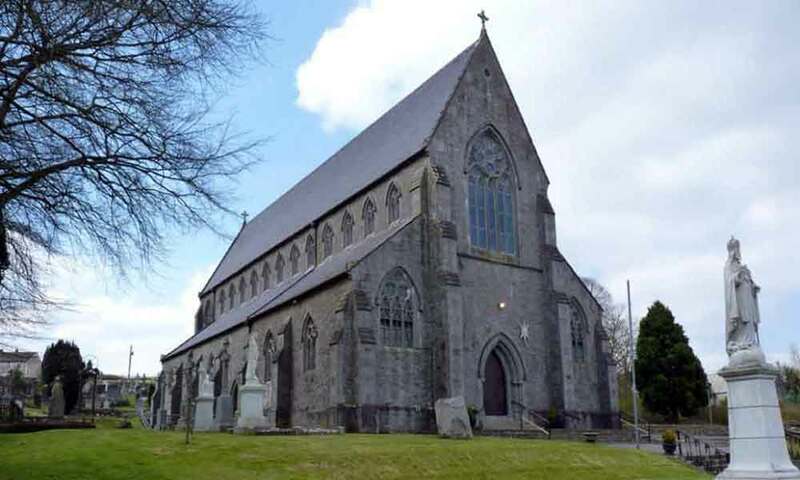 History: In 1302-07 Killenaule church was held impropriate by the Prior of the Holy Trinity, Dublin (Christ Church Cathedral) and was valued at 26 shillings (Cal. State Papers Ire., 1302-07,285). In 1437 Killenaule appears in the list of Procurations for the Diocese of Cashel and Emly and was a taxed of 12 shillings. Interestingly Killenaule appears to have been mistakenly recorded as its own deanery (Seymour 1908, 331). 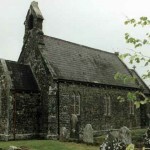 Richard Mauncel was chaplain of Killenaule in 1441 and was recorded as a burgess (Orm. Deeds III, 131). A papal mandate from 1491 the vicarage of Killenaule was taken from Robert Vhyte who claimed to be a priest and given to his illegitimate son Gerald Vhyte , a clerk of Cashel (Cal. Papal Regis. xv, 746). In 1498 the vicarage passed to Waltarus Buttler Clerick of Cashel (Ryan & Skehan 1966, 24). 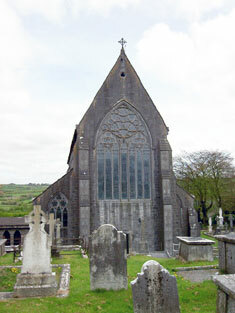 The perpetual vicarage of the Parish Church of St. Mary Killenaule was recorded as vacant in 1507 (Cal. Papal Regis. xviii, 505). In 1615Thomas Wilson Archidiaconus of Waterford held the vicarage of Killenaule from the church of Dublin (Holy Trinity), although no service was held at the church (Murphy 1912, 282, 290). In 1640 James Walsh a Knight of Waterford held the vicarage of the Killenaule when the tithes were recorded as £20 (Civil Survey I , 102). The Down Survey Parish Map depicts the church as a ruin to the south of the Castle with six to seven square patches of glebe land scattered around the townland. Interestingly the church and its glebe lands were still held by Christ Church (Holy Trinity) in Dublin in the nineteenth century when the glebe were depicted in a map of the lands held by the Chancellor of Christ Church, Dublin in 1816-1817 (National Library 21F 47(7-8)). Location: Killenaule is situated in the hills of Slieveardagh, on the cross roads of the main road running east-west through the hills from Kilkenny to Cashel and the road running north-south from Slieveardagh towards Fethard (Fig. 26). Killenaule is sited at an altitude of between 150 metres and 160 metres and has a south-easterly aspect in the shelter of the hills. A stream flows next to the site and there are a number of wells around the area. Description: There are no upstanding medieval remains at Killenaule. The site is occupied today by a town. The site of the church (36) is occupied by a modern church; the site of the castle down hill, across a stream one the edge of the present town (Fig. 57). River street, to the north of the church, bends along the precinct of the pre-Norman church. The focus of the modern town is Main Street, River Street and Bailey Street. The garden plots of the houses of the town are long and thin and reminiscent of burgage plots in a medieval town , however, Killenaule was substantially developed as an estate and market town in the post medieval period (William Nolan, personal communication). Comment: Killenaule parish centre settlement had the status of a borough but probably never developed beyond its agricultural base, remaining a ‘rural borough’. The burgesses recorded in 1441 held land in Killenaule which entitled them to the privileges of a burgess without actually having to live in a nucleated settlement. The borough remained a parish center, possibly with houses at the cross roads as suggested by figure 57, but it did not constitute a village or town. History: Killenaule is mentioned as a sub-manor in the rental of the capital-manor of Knockgraffon in 1308-09, held by Philip Stanton, Knight, Poer and Sutton for a rent of 40 shillings (Orm. Deeds I, 164). There appears to have been a borough in Killenaule by 1358, when the Reeve and Community (of the borough) were fined by the Seneschals court (Orm. Deeds II, 38; Bradley 1985,58). In 1422 Geoffry Baron, chaplain, granted Edmund Fitz Thomas Ie Botiller (Butler), Knight, his lands in the manor of Killenaule (Orm. Deeds Ill). Eight burgesses of Killenaule are named in 1441, which had a total rent of 20 shillings; the burgesses were Nicholas White (-), Peter son of James Ie Bottiller (4 shillings 6 pence), John son of Simon Cantwell (6 shillings), David Brvis (6 shillings), Walter son of Robuck Cantwell (-), Thomas his son (-), Richard Mauncell chaplain (18 pence) and Gerot Rethonagh near Nothe (15 pence) (Orm. Deeds III, 212). A castle was recorded at Killenaule for the first time in 1482, where it is described as the Earl or Ormond’s Prison (Orm. Deeds III, 246-7). In 1640 the parish of Killenaule was held by the Earl of Ormond and James Sall of Mealdrom, Middlethird Barony in county Tipperary. The townland of Killenaule was described as waste without improvement in 1654 (Civil Survey I, 104). The Down Survey depicts a castle, church with four scattered glebe fields and one cabin. In 1659 the adult population of the townland of Killenaule was 28 (Pender 1939, 296); in 1666/7 the townland had 14 households, including a forge (Laffan 1911, 133) – THE END. The present Catholic parish of Killenaule & Moyglass was made up of six civil parishes Magorban; Graystown; Ballinure; Cooleagh; St. Johnstown and Killenaule. Arbour Hill; Ballyvadin; Clonbrogan; Coalraine; Curraghtarsna; Knockbrett; Mobarnane; Magorban; Mocklershill; Silverfort; Woodhouse and Foulkstown. Ballaghboy, Ballintogher (Part of); Ballynonty; Mardyke; Derricknew; Graystown; Kilboy; Lurgoe; Dunguib (Part of); Noan; Springhill (Part of). Coolbawn, Grangebarry, Cooleagh, Kilbreedy, Moyglass (Part of) Lismortagh, Milltown St. John. St. Johnstown, Kilkennybeg and Lismoynan. Ballyphilip; Castlequarter; Cattaganstown; Cooldine; Crosscannon; Garrane; Graigue Lower; Graigue Upper; Killeens; Killenaule; Knockabritta; Knockavardagh; Kylenahone; Monslatt; Mortlestown; Mount Taylor; Rathmoley; Rathroe; Roan. The town of An Sásarach (An Sásarach is derived from a surname of Anglo-Norman origin which is recorded in Ireland in the late 13th century as le Sauser. The town of Mac Philib (The surname Mac Philib is well documented in various sources relating to this area, such as Hearth Money Records (1665-7). There are a number of other examples of Baile Mhic Philib as a toponym in Co. Tipperary). The town of Ó Maidin (Ó Maidin commonly anglicized (0) Madden). The quarterland of the castle (The Irish form of the translation. However, Ceathrú an Chaisleáin is a place-name of common occurrence. 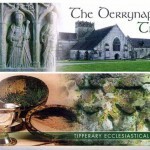 Other examples are recorded in Co. Tipperary. 0rmond Deeds. Its earlier derivation remains unclear. The meadow of Brógán (Brógán is probably a saint’s name). Liach has a number of meanings, both as a noun and as an adjective. Perhaps liach, meaning ‘a trowel, ladle’ is intended. (Cuailleach in this instance seems to be a development from earlier Coilleach, meaning wooden place). The meaning of ceanann is uncertain in the present context. As an adjective ceanann conveys the meaning ‘white-headed’). The town of Fúca (Fúca, a personal name of Anglo-Norman origin. The name is derived from old French forma Fulco and Fourques. The town of An Graech (An Graech, derived from the Anglo-Norman surname, de Grey. Derives it’s name from Raymond Le Gros, who built Graystown Castle in 1170. Brendanus from which the English form Brendan is derived. The hill of An Briotach (An Briotach, this surname which comes from Old French Le Bret The Breton’, is recorded as Le Bret, Le Brit in documents relating to the early Anglo-Norman period in Co. Tipperary. It was gaelicized as de Brit). The hill of An Bardach (An Bardach, a gaclicization of Ward, a surname of English origin. The church of the cave, underground passage etc. Derives it’s name from the Lane Family, who were the original owners of Lanes park Estate. It was formerly known as Ballygrenny – Buaile Ghreíne (Cattle pen of …. meaning of Greíne unclear). The shin (Conveying the meaning perhaps of ‘a long strip of land’). An adaptation of Mardyke, the English form of the placename. Mardyke seems to have been introduced here as the name of a coal mine. Other examples of this toponym exist, such as Mardyke, Co. Cork where its original meaning ‘marsh bank’ is very suitable. The town of An Moirtéalach (An Moirtéalach, derived from Anglo-Norman Martel). The cave, underground passage etc. The red place of An Móileach (An Móileach, see previous explanation). The garden of An Stocdúnach (An Stocdúnach, derived from Stocton, a surname of English origin. The town of An Seánach (An Seánach, gaelicization of the Anglo-Norman surname de Saint John/Jean which excludes the Saint part of the name).